To bring the Law into the domain of the Gospel is to undermine the good news of Jesus Christ, transforming a pure gift into a human achievement. Such mingling of Law with Gospel dilutes the precious promises of God with demands for works. In short, the Gospel is polluted and rendered impotent. To use another biblical metaphor, a pinch of the yeast of the Law hidden away in the dough of the Gospel ruins the whole lump. We are not left with the bread of life but with stale rations that cannot sustain those who journey through the valley of death’s shadow. On the other hand, to mix the Gospel into the Law is to create the illusion that the Law offers hope. Inserted into the Law, the Gospel weakens but does not remove the threat of the Law. Such a blending of Law and Gospel invites sinners to place their confidence in their own efforts—“motivated by the Gospel,” as it is said. The Law is lifted up as a set of principles or rules that may be obeyed and fulfilled with the aid of God’s grace. This synthesis of Law and Gospel corrupts both, driving broken sinners either to a false security or to unholy despair. In his defense of Thesis VI, Walther turns to Galatians 3:11–12 where the apostle Paul says: “Now it is evident that no one is justified before God by the law, for ‘The righteous shall live by faith.’ But the law is not of faith, rather ‘The one who does them shall live by them.’ ” The Law has absolutely no power to make human beings righteous. It has nothing to say about God’s grace in Jesus Christ. It cannot create faith. The faith that the Law demands is not a work that we can accomplish. Faith is purely passive, completely receptive of the gift of forgiveness bestowed by the Gospel alone. “For when God creates faith in man, this is as great a work as if He were to create heaven and earth again,” says Luther. This faith comes by hearing the Gospel, not the Law. “So faith comes from hearing, and hearing through the word of Christ” (Romans 10:17). The Law creates the knowledge of sin, but it is powerless to give the knowledge of salvation (Romans 3:20). 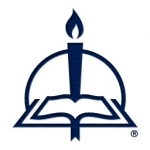 The Law remains Law and the Gospel remains Gospel. Jesus did not come to destroy or displace the Law but to fulfill it (see Matthew 5:17–19). So in proclaiming the Law, its threats must be spoken without adulteration. “Whenever you preach the Law, you must always bear in mind that it makes no concessions. That would be completely contrary to the character of the Law, because it makes only demands” (Law and Gospel, 90). God gave humankind His holy Law imprinted on the heart and inscribed on tablets of stone at Sinai. He gave the Ten Commandments, not the “ten suggestions,” as one wag put it. God’s Law is not an arbitrary imposition on human beings. It is a divine requirement that imposes itself “out of the conditions of creaturely life,” to borrow a phrase from James Nestingen. It will not relax its limits. The Law cannot be toned down as though God were not absolutely serious in His demands for perfection. It is impossible to whittle the Law down to manageable size as though the Almighty, like a doting schoolteacher, might grade on a curve, relaxing His stringent standards. James Arne Nestingen, “The Lord’s Prayer in Luther’s Catechisms,” Word & World 22 (Winter 2002): 39. From Handling the Word of Truth, Revised Edition, pages 53–55 © 2015 John T. Pless, published by Concordia Publishing House. All rights reserved. 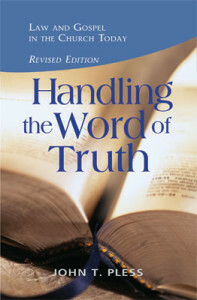 To order Handling the Word of Truth, please contact CPH at 800-325-3040 or visit www.cph.org.